Taste test: These are pretty good vinegar chips. Nice vinegar flavor, not too strong, and they have a good crunch to them. Trivia: Everything's printed in French and English. 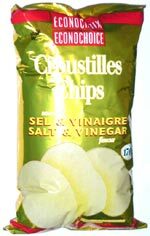 French for Econochoice is "Econochoix" and salt & vinegar translates to "sel & vinaigre."